BETWEEN IRONY & SINCERITY: IS IT POSSIBLE FOR AN ARTIST TO BE SINCERE IN 2017? In this essay I shall be discussing whether or not it is possible for a contemporary artist to be sincere. Post-modernism has taken irony for its own, meaning it has become unstable in an artistic culture of anti-sincerity and meta-ironies. This text will also articulate that it is not solely a certain style(s) one can consider sincere. The irony that post-modernism uses has become the opposite of sincerity, a place in which it does not belong. This text shall also briefly touch upon post-modernism as a free-floating signifier and why this is toxic. In this essay I shall be covering what it means to be sincere within the contemporary art world, and whether or not it is still possible for an artist to be sincere, without that sincerity being irony through sincerity. I shall also make it clear that there is no correlation between style, zeitgeist and irony. Alongside discussing how post-modernism as a free floating signifier has turned irony and sincerity into opposites. The purpose of this chapter is to articulate to you, the reader what I mean when I say irony and sincerity, to find clear definitions of each before praising or possibly denouncing either. Alongside ironies original definition this chapter will explain the specifics of stable and unstable ironies and what effect they can have on a work of art, or more importantly a work’s meaning. Chapter 2: Is Sincerity Within the Contemporary Art World Dead? Within this chapter I shall cover why I believe sincerity within the fine arts has not only disappeared, but is dead, or more specifically has been killed. I shall discuss which art movements I believe unwillingly helped in its death and which movements willingly watched as it passed away. Chapter 3: The Toxicity of Post-Modernism as a Floating Signifier. This chapter will explain why I believe the ambiguity of post-modernism has become a toxic force within the arts, especially where irony is concerned. Discussing how post-modernism has skewed original definitions which in turn create instabilities within meaning. Though post-modernism, as contained within everything is up for criticism, I shall explain how its internal-elitism protected by pretentious and pompous language almost creates a non-criticisable movement. Chapter 4: There is no Correlation between Zeitgeist, Sincerity and Style. This chapter shall touch upon the presumptions the reader could make from the previous chapter’s ideas on style and sincerity, and will use examples to prove that neither zeitgeist, artistic style nor sincerity have any correlation, and that more specifically no ‘certain’ style is always in-keeping with sincerity. Chapter 5: Is it no Longer Possible for an Artist to be Sincere? This chapter, with the foundation of the previous chapters shall now discuss in confidence, why it is I believe it’s no longer possible, or at the very least extremely unfavourable for a contemporary artist to be sincere, that is, without treading into the realms of meta-irony and being ironically sincere, thus proving post-modernism’s ambiguity has caused a troublesome Catch-22 for irony and sincerity. They say the opening sentence of any text is the most important, this being that sentence; an aggravatingly-erudite attempt at very quickly articulating to you, the reader, as to what irony is. This of course being one of two things: a sincere attempt at showing what irony is, or irony in its purest form, not just the first two sentences but this entire paragraph may be an attempt at pure-ironic-articulation of what irony is. Thus we enter into irony’s intricate workings. There is no real concise definition of what irony is, in fact if there was to be such a thing it in itself would be ironic. However this gratuitous rhetoric is of no help, so first we must deconstruct. 1. A technique of indicating, as through character or plot development, an intention or attitude opposite to that which is actually or ostensibly stated. 1. They are all intended…they are not mere openings provided unconsciously, or accidental statements. 2. They are all covert, intended to be reconstructed with meanings different from those on the surface. 3. They are all nevertheless stable, once a reconstruction has been made the reader in not then invited to undermine it with further reconstructions…unless they choose to do so on their own. From these four marks we gather that a stable irony is just that, stable, intended to be there, not intended to be found unless one is sensitive in detecting such a thing and its subject’s scope is limited. For instance: “as pleasant as a root canal” if someone was to say this to you, you would at once recognize two things, the word pleasant, and root canal, and that both are opposites, as in a root canal is not pleasant, thus…irony, a very stable irony. For an artistic example of irony one has to look no further than Marcel Duchamp, in particular his magnum opus Fountain . There is the irony of course that a urinal is art, which has long since been discussed in intricate detail and thus I shall not bore the reader here, that however is one of the stable ironies at play here, the pre-conceived notion of what art is vs. the vulgarity of a porcelain urinal. Fountain was one of Duchamp’s ready-mades, a collection of objects he found…readymade. This is not where the irony lies however, if one is to look at the table of illustrations, more specifically Fountain, one will realise that the image of the readymade below is actually an image of a replica. In fact all the currently existing Fountains are anything but readymade, they are all replicas. This is a clear example of an irony that is stable, yet not so obvious that it erodes the soul with its banality. The ease that is sincerity, to be sincere is to whole-heartedly mean what you say, do and present, without tricky-erudition, covert-meaning and a stable ‘image’ that is what it says it is. As simple as if a friend was to open your front door (from the inside) and tell you that it is in fact raining, thus meaning your plans are altered etc. Your friend is being sincere; whereas an ironic or post-modern friend may say something quirky like: “Boy, it sure is looking lovely outside!” (That is, this would be said ironically if it was raining.) 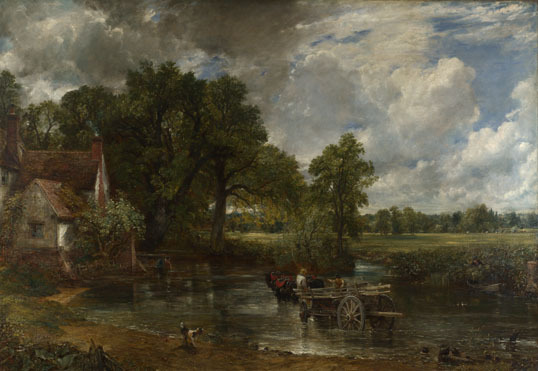 To articulate sincerity artistically, John Constable in 1821 painted The Hay Wain a picturesque oil painting of the River Stour between Suffolk and Essex, there is within this painting no furtive brushstrokes, or elitist-clandestinity, no. This is genuinely just a painting of a scene. The image therefore becomes sincere, within its own paradigm it is the truth, and there is no hidden agenda. IS SINCERITY DEAD WITHIN THE CONTEMPORARY ART-WORLD? One would be lying if they were to say that contemporary galleries today were sincere, when I speak of contemporary art I speak of artists who are currently working and have exhibitions in at least nationally recognized galleries, for some this may seem rather specific, however if one was to include all ‘contemporary’ artists one has to include local watercolour painters and the like, whose efforts are sincere (bless them), they are not however studied at an academic level or renowned for any further advancement of art. Pre-1960’s the art-world was to a certain degree, still very sincere, yes there were occasionally pieces of significant merit which went on to become aesthetic-martyrs such as Duchamp’s Fountain or the DADA movement as a whole. Before this point the reason for a picture or a work was to sincerely articulate an idea, though sincerity and realism do not go hand in hand, one can be sincere about creating a work with an aesthetically-emotional view in mind (Monet, Van Gogh etc.). Artists such as Monet or Van Gogh however lived in entirely different times to ours, this is unarguable, the times we live in have become fractured and information has become insincere, that’s not to say the times Van Gogh lived in didn’t have their own troubles it only seems that art as a whole is at a loose end, or at least redefinition is becoming more difficult to achieve. There is no more original only refinement. Though to say ‘it’s been done before’ is just a banal platitude. Let’s take an exhibition pre-1917; one may ask why 1917 and not 1960 as I previously stated, I would argue 1960 was when a more mainstream change to sincerity and artistic values happened, whereas 1917 is when the value changes first started happening. The exhibition in question is Lex Fauves Exhibition at Salon d’Automne (1905), one of the most famous Fauvist exhibitions, if not the Fauvist exhibition including Henri Matisse and Andre Derain to name a couple of artists, I am no expert in Fauvism, this is simply an exercise in taking a random exhibition pre-1917 and assessing its ironic or sincere merit. 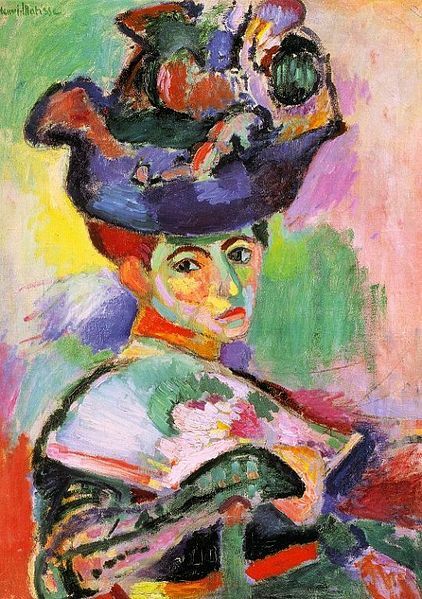 The exhibition contained images alike Woman With a Hat of a Fauvist style: painterly qualities and strong colour over realism and representation, though a certain (large, in comparison to post-modernism) amount of realism remains. This, a randomly selected exhibition pre-1917 has no attachment to irony; there is no erudite reason as to why the colours are vibrant, or ironic-deconstruction of representation. One could however argue that pre-1917 there are still leaps to be made within the idea of realism and painting, and that pre-abstract art irony would not have been used gratuitously (if at all) due to basic barriers that were still yet to be crossed within the realms of taboo and aesthetics. One could say these images were some ironic rebuttal against realism, this would be rather pedantic. I would argue that the images were a sincere attempt at something other than realism, the artists are sincere in their semi-impressionist aesthetics; this of course carries across many art movements. MOMA’s 1965 exhibition Recent Acquisitions: Assemblage (1965), the exhibition in question a collection of assemblage artworks including Pablo Picasso’s Guitar and Hannah Hӧch’s Indian Dancer, a couple of key names in art history. It is not however the art that interests me, it is what has come from the art, the theory, and one quote especially caught my eye “The question interests me, not the answer. The question is infinity; the answer, too definite…Art for me is the possibility of plurality.” (Bauermeister, 1963) With sincerity you find the definite, with irony you only work with a question, with ambiguity. There still is some sense of sincerity here however, for Bauermeister is being sincere about the plurality she is seeking. One should note that such an example begins the sway of the stability pendulum; there is no mention of irony thus-far, only a certain sincerity of being insincere, a search for the plurality, or duality of meaning. I once gain shall return to E Unibus Pluram for a quote I find favourable, yet antagonistic towards this kind of artistically favourable eruditeness: “the ability to interdict the question without attending to its subject is, when exercised, tyranny” (Foster Wallace, 1993) what I find interesting and relevant about this quote is that Foster Wallace talks of the ability to interdict the question, not actually to deconstruct a pre-existing question. Whereas Foster Wallace talks of the future where questions are created and not answered, Bauermeister is taking a question that may have once had a ‘definite’ and deconstructing to pluralize that definite, however she is acting this out with sincerity, there is no pluralism is her attempts to pluralize. 40 years later in 2005, the Paula Cooper Gallery in Chelsea, New York exhibits the works of Rudolf Stingel, the self-titled exhibition (2005) in near enough an empty [white] space, with the addition of a hyper-realistic portrait of Paula Cooper herself, who was Stingel’s dealer for more than 10 years (at that point in 2005). “The white floor turns the gallery space into a vast immaculate expanse, which will progressively become stained and mottled under the footsteps of gallery visitors. Stingel’s floor installation transforms our perception of space and the well-known “purity” of the white cube, so ubiquitous in critical discourse on contemporary art in the last 30 years. Overlooking this blank, pristine landscape will be one photorealist painting of Paula Cooper, who has been Stingel’s dealer for more than ten years” (2005 [internet] ) An interesting combination of post-modern meta-theory and the self-awareness of the foundations which helped in the creation of that theory. There are multiple factors of interest at work within Stingel’s installation: Firstly there is the clear absence of art, bar two pieces, firstly: the space, as is said in the gallery statement will noticeably be walked on, thus the space becomes self-aware, the space that usually houses the artwork becomes the art work, a kind of meta-art wherein the foundations housing the ideology or aesthetic become their own. This very quickly causes an instability, for one without knowledge of the gallery statement the viewer may come to believe that there is just the painting and that the artist only intended for it to simply have space, and that the ‘white-space’ (Further reading: Inside the White Cube) as an idea is not part of the work, this though a possibility is pedantic and unlikely. However, once the viewer figures that the white-space is part of the work questions begin to arise which are left unanswered, are their footprints part of the work? Are they, as in the audience, as they are within the ‘space’ part of the work? (This is never a question when the gallery is simply used as means of housing and showing and not articulating the art.) Though these questions may seem interesting, there’s a definite instability here as multiple ironies exist. 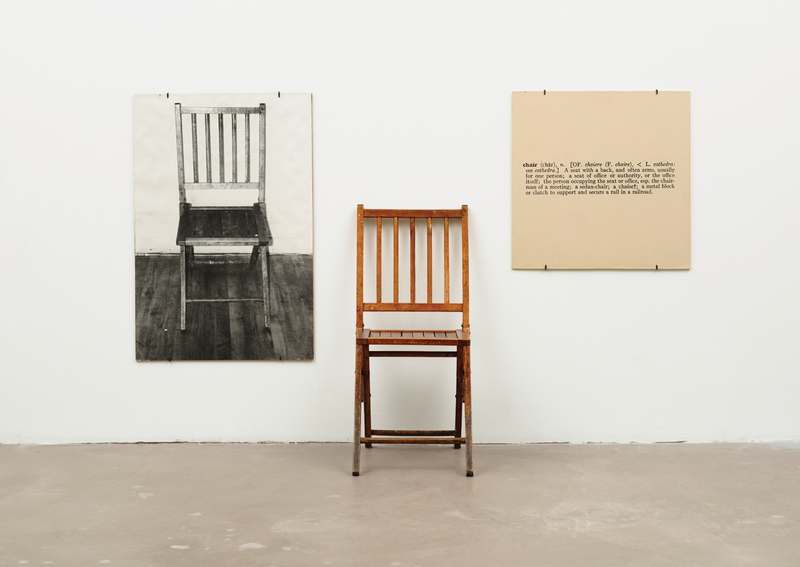 One could argue the artist is being sincere in their attempts to allow the space to become the work; however a counter-argument would be that Stingel is being insincere, or even ironic about that abstract-sincerity. The second piece within this installation: the painting, also implies another level of self-awareness, though not as ‘meta’ as using the actual foundations of the physical artwork as the art, it does imply the artist is using the non-physical aspects of the artworks existence and placement as the art, as in using an image of the person who in a certain way will have funded his i.e. the artist’s career and created the ability for him to exhibit within this space (i.e. Stingel’s art dealer Paula Cooper). These multiple levels of cognizant process and articulation create an instability between intentional and unintentional irony, which, if an audience member also became aware of could add another layer of confusion, Wayne C Booth once again clears up these seemingly unattached aesthetic and ideological ambiguities: “…brought to profitable terms if critics made clear which kind of contribution they are attempting…redefinition of terms…illumination of meaning…exploration of significance…the final significance of any work might be thought of as the accumulation of what all “private sensibilities” could make of it.” (Booth, 1974) One, again, could argue that post-modernism from the off cast aside ideological underpinnings and thus this exhibition is purely iconoclastic, post-modernism’s escape from the utopian-esque answers of Modernism can only be articulated and perhaps to go as far as to say proven by the manipulation of Modernist ideas, again creating an instability. A ‘floating signifier’ is word that doesn’t point to any object, or actual agreed upon meaning, I cannot think of anything more apt than post-modernism to fit into this category; a movement which almost prides itself of not having an ideological foundation, and of its iconoclastic values, addressing the fact that its main qualms are with modernism’s ideas of a total or utopian view of the world. The only problem here is that post-modernism can only move forward by referring to those who they are ‘post’ thus, they are creating a new foundation, which is the idea of no foundation, there can never be a ‘non-foundation’ in the same way that a blank manifesto is still a manifesto. Post-modernism as a floating-signifier very quickly becomes toxic, as the term is a constant, especially within the contemporary art world, the term ‘post-modernism’ is in constant use, yet has no clear definition. Of course, no art movement worth its weight within art history could be explained within a page, however most can be explained within 1 book, post-modernism simply cannot be explained due to its lack of inherent explanation; at least the primary objectives of post-modernism cannot be explained in their relation to external movements or theories (often those that they are against). One could argue that nothing can be explained without any relation to past or adjacent ideas, this is true, however once such movements have been articulated they come into their own and are released from their burden of comparison, something which post-modernism has yet to achieve. Art without any footing begins to be interpreted in unstable ways, the lack of post-modernism’s inherent footing is due to the fact that for them to take on any foundation or ideological footing would be entirely hypocritical, thus they become stuck in a catch-22 wherein as soon as they allow a clear interpretation of their work a foundation can be constructed. Thus to call yourself a post-modernist, is only to say that you a ‘creative’ that works after-modernism. When however the floating signifier that post-modernism is takes something for its own, such as irony, it becomes disjointed such as post-modernism is; so an irony that would have once had a footing; previously discussed by Wayne C. Booth as “…redefinition of terms…illumination of meaning…exploration of significance… the accumulation of what all “private sensibilities” could make of it” (Booth, 1974). One can almost conclude here that post-modernism creates a fragmented idea of irony in that due to its loose ideological foundations the viewer has nothing to grab onto as a reason to interpret the present irony into a stable interpretation of the whatever the pluralism is the artist is trying to address, meaning that not only is the work itself unstable, but post-modernism as a whole becomes unstable. Within “Kosuth’s work there is not one hint of humour, or that Kosuph might be looking at the relation between aesthetics and semantics in a way which seems nonsensical, this work is working with the instability of semantics, however it is stable and sincere about that its dialogue is about that instability within semantics; the instability being that the meanings are congruent in certain semantic fields and incongruent in others, therefor this is a clear example wherein the style is unlike the previous sincere-style examples (expressionism, realism etc.) yet is still sincere. Jack Vettriano’s The Singing Butler is actually a complex example of how style, zeitgeist and sincerity can cause confusion and instability. Vettriano is a ‘best-selling’ contemporary painter, his works can be found on calendars and cheap-mall-canvas’ alike, however what one; at least post-1930, could find intriguing about Vettriano’s work is that there is not one hint of irony, and that he isn’t even being ironic about not being ironic. Which leads one to believe that Vettriano is entirely sincere in his soft-core romanticist stencils of humans, this causes instability, because work such as Vettriano’s seem entirely out-of-place in the contemporary art ‘scene’. Many would find Vettriano’s style retrograde, a type of now-irrelevant kitsch, with a certain amount of egotistical-misogyny thrown in for good measure. Wherein Kosuth’s conceptual-style in actually being entirely sincere, it is doing so alongside an out-of-place style, that of Jack Vettriano, this is a quick exercise in mirroring two pieces of art attempting to be sincere, however their styles are worlds apart. IS IT NO LONGER POSSIBLE FOR AN ARTIST TO BE SINCERE? This question has many problems attached to it, firstly if an artist wants to be sincere and is working and wants to be known as working within post-modernism, they would either have to grin and bear the cringes of their friends, and the statements that no likely would be along the lines of banality, or asking if said artist was doing so ironically? Either that or they would have to make it clear they are not a post-modernist, which seems to have failed thus far. Take for instance the Stuckist movement, founded in 1999 by Billy Childish, a movement which is very opposed to conceptualism and believes only in painting, though has been known to venture to other mediums as long as they’re not conceptual. The Stuckists themselves seem stuck, it’s been made clear that what they are doing is not furthering art and is simply stuck in its place, arguably they have gained world recognition, though ironically its more for their thought and concept on the matter of conceptualism rather than their aesthetic rebuttal against it, thus their attempts at sincerity were faltered at their first hurdle, their idea has and always will be before the work, for if you weren’t creating the work knowingly sincerely then you would not be a Stuckist. Another attempt at sincerity within contemporary art comes from Andy Holden’s manifesto Maximum Irony! Maximum Sincerity (Holden, 2003) in which Holden and his peers agree we are “in an age of irony mourning for sincerity…the ironic whale that swims in the sea of post-modernism.” I find it quite apt that Holden says that the sea is not ironic but it is only a small thing swimming about within it, there is however far too many sightings of this rare whale, to the point where whale-sightings within post-modernism are getting gratuitous and just as ‘dull’ as the sincerity that remains without it. “Let us not be ironic about our sincerity, let us be sincere about our irony. (Holden, 2003)” I do believe many artists are sincere about their irony and about the fact they are being sincere, however there are some that are ironic about their sincerity, if this is the case, at least for contemporary art does it not then become impossible for an artist to be sincere? To what it is you are trying to prove. For a statement about your sincerity would only make people question it further. Sincerity then, at least where the art world is concerned has simply become a counter-part of irony, an opposite, which is not where it belongs. If one was once again to travel down the routes of post-modernism and become self-aware and referential, once could as an audience member wonder if what it is I have written is sincere, or ironic. I have not mentioned if I want to redefine terms, or illuminate meaning or even question significance. For if I am writing this ironically it then becomes a work, if I am writing this sincerely then it is but research, what is there here to connote whether it is ironic or sincere? In conclusion we find that if a contemporary artist wants be sincere they either find a way outside of post-modernism to say that they are being sincere. Or they become ironic about their sincerity, which to any artist genuinely wanting to creating impressionist or modernist works would be rather upsetting, wherein if an artist is to paint in an old or ‘dated’ style, such as previously mentioned contemporary romanticist Jack Vettriano, they are going to be thought of doing so ironically, thus entering themselves into a catch-22. The one thing that it becomes impossible to do is be sincere about your sincerity, at least within the contemporary art world. Post-modernism’s scorn at retrograde styles creates a problem, wherein it is the un-idea of those works that becomes scorned at, as in, those working in a retro style are more often than not being entirely sincere, therefor it’s sincerity that becomes frowned upon and not the aesthetic step backwards. The post-modernist belief that those who are being sincere are automatically considered to be unaware and ignorant to contemporary shifts within the art-world. Booth, W.C. (1974). A Rhetoric of Irony. 2 edition. Chicago: The University of Chicago Press. P5-6. P16. P23. Foster Wallace, D (1993). E Unibus Pluram. The Review of Contemporary Fiction reprinted in A Supposedly Fun Thing I’ll Never Do Again (2010) p81. P68. New York: Little Brown & Co.
Holden, A (2003) Maximum Irony! Maximum Sincerity, [Internet], http://www.metamodernism.com/wp-content/uploads/2014/09/MIMS.jpg Accessed November 2014. Hyde, L (1987). Alcohol and Poetry: John Berryman and the Booze Talking. American Poetry Review reprinted in the Pushcart Prize anthology for 1987, Dallas: Dallas Institute of Humanities and Culture. Paula Cooper Gallery, (2005) Statement on Rudolf Stingel exhibition [Internet], http://www.paulacoopergallery.com/exhibitions/26 , Accessed November 2014. LS on Bugmen: What are they? fedoraneckbeardleddit on Bugmen: What are they?